Team: Brian, Laura, plus the "Jeep gang"
Big Jeff died of cancer at 43. We honor him and his wishes with our annual Celebration of Life. Here's an explanation of what that means. After driving over from Boise, I met Brian at the Hood River bridge. We ditched my car and started up the road to Trout Lake. 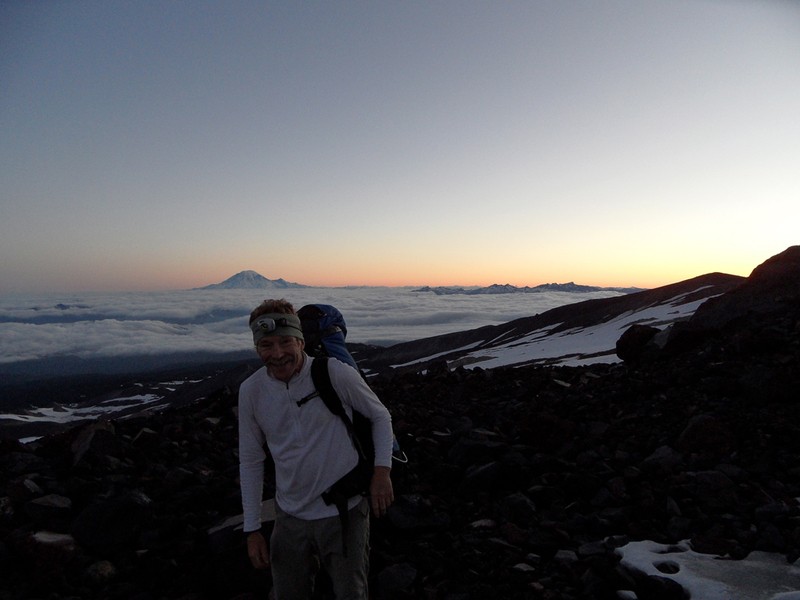 Brian and I had done Mount Adams together several times, all by the south side route. 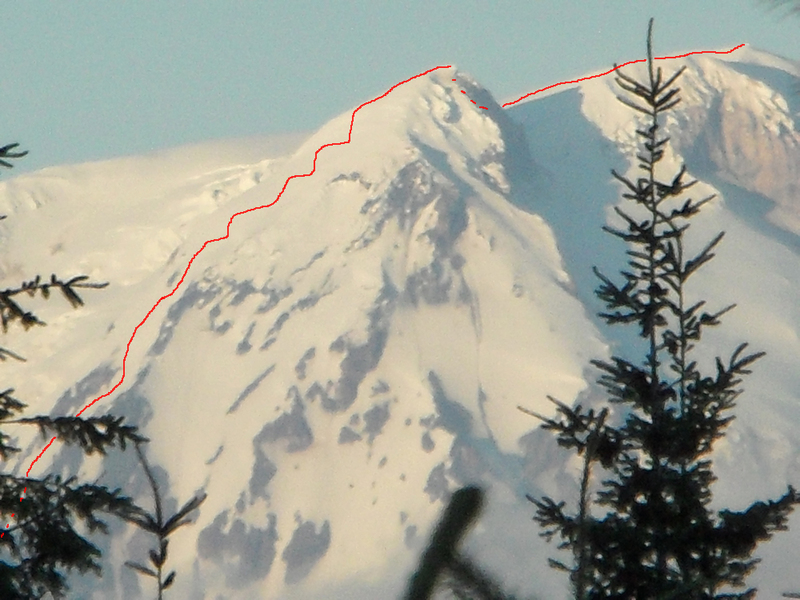 So today we were going after the North Face of the Northwest Ridge, marked in red. 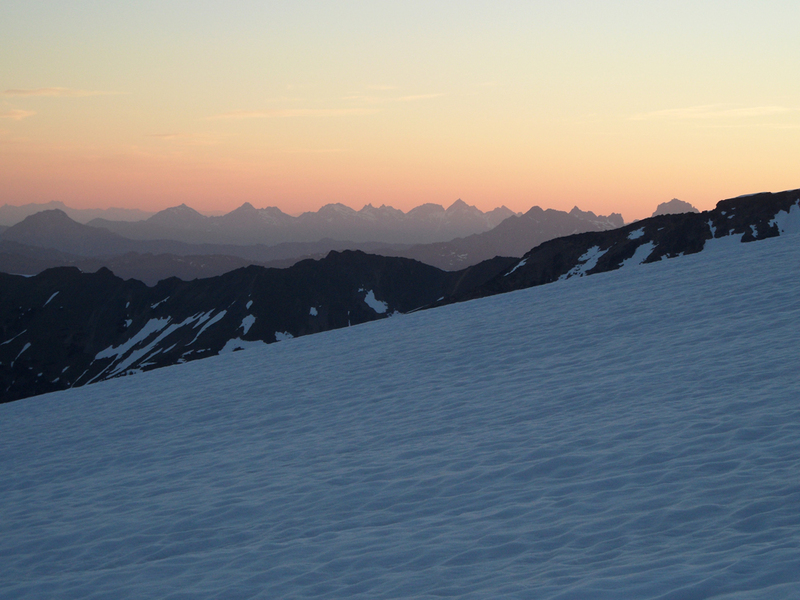 The Adams Glacier is to the left of our route, and just to the right is the northwest ridge. The far left horizon is the north ridge. Note that the summit is not in view. This picture was taken from the road on the way to the trailhead on Saturday. This picture was taken from near Mt. 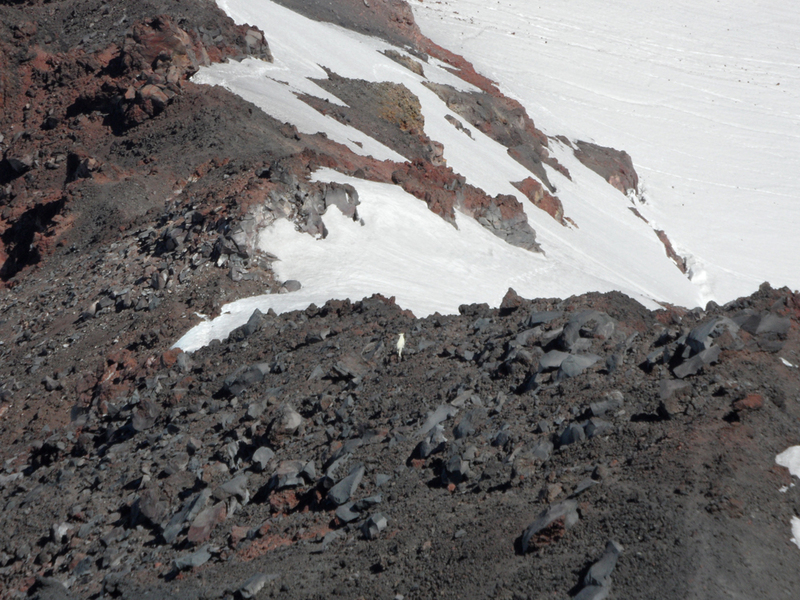 St. Helens on July 22. You can clearly see the flase summit (The Pinnacle) shown in the previous photo. 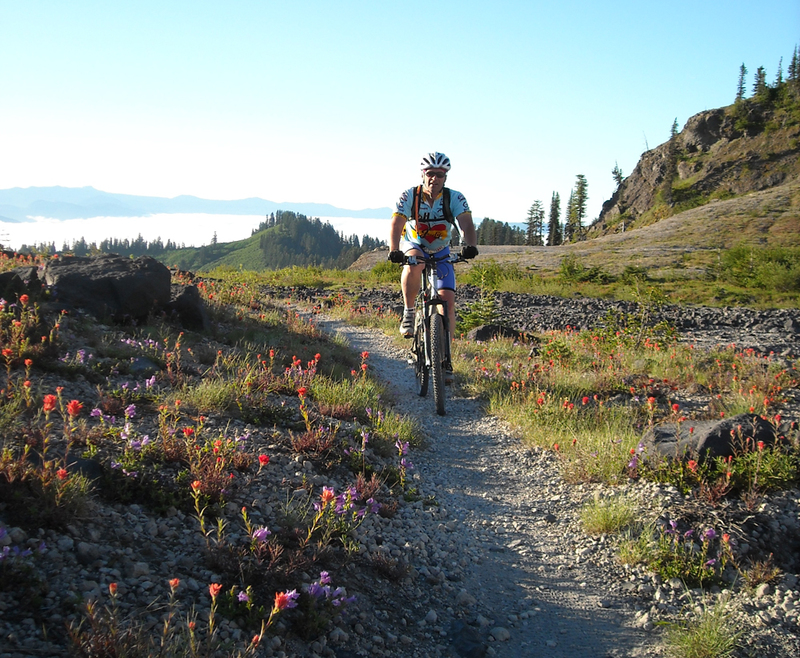 This route starts 1500' lower than the south side route, at the Killen Creek trailhead. 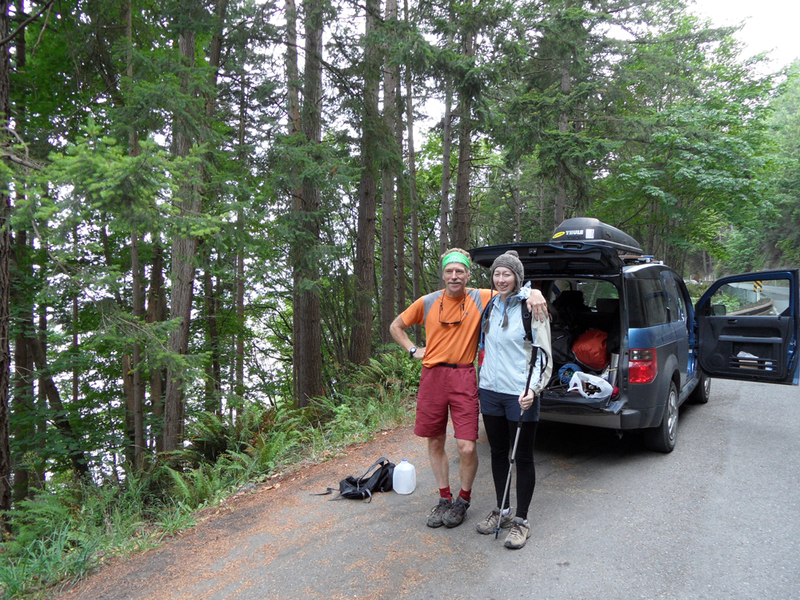 We left the car at about 4pm and hiked up the Killen Creek trail to the Pacific Crest Trail, which was under snow. From there we hiked up to high camp, which is somewhere in the vicinity of this picture. No matter, after a two-hour hike we found some dry ground and set up camp. Calm winds, clear skies, and not a soul to be seen. The next morning we got up at 3:30 and were rolling at 4:15. 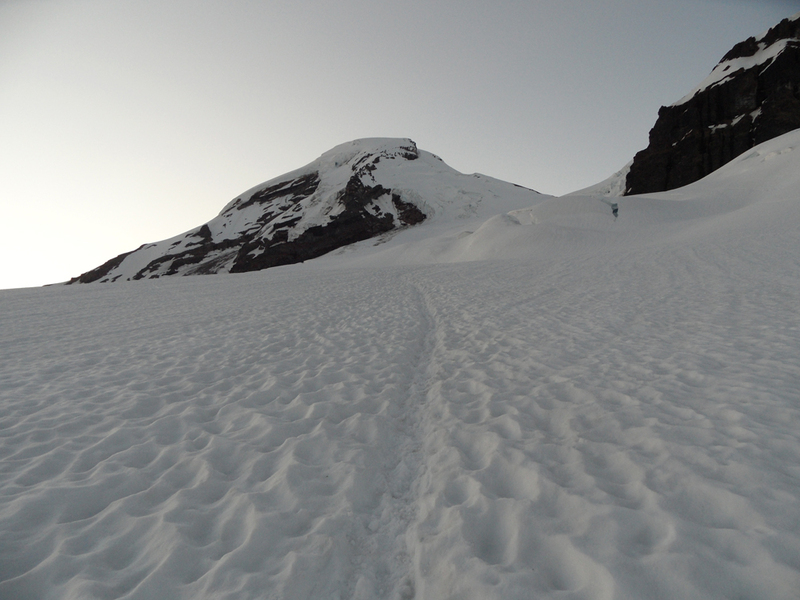 We started traversing low on the Adams glacier to avoid crevasses. 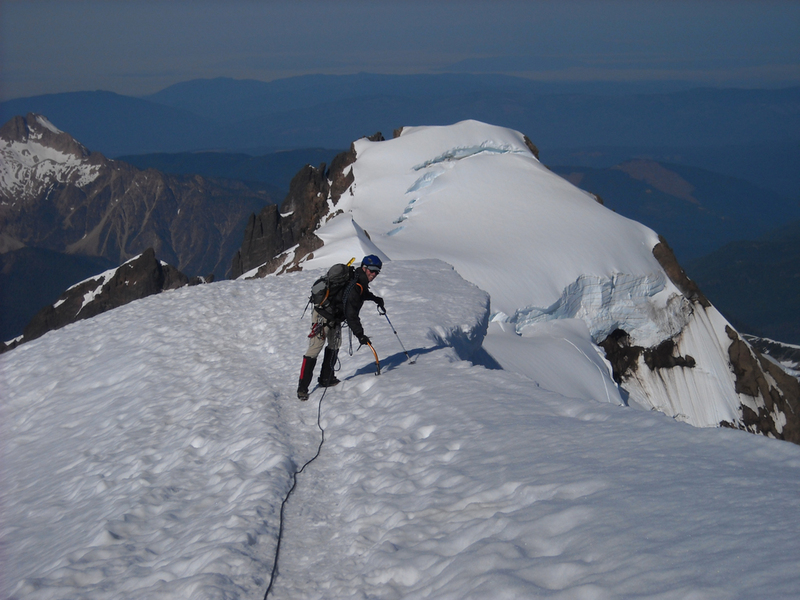 At about 5, we reached the NW ridge and stopped to put on crampons. That's Rainier poking through the marine layer. 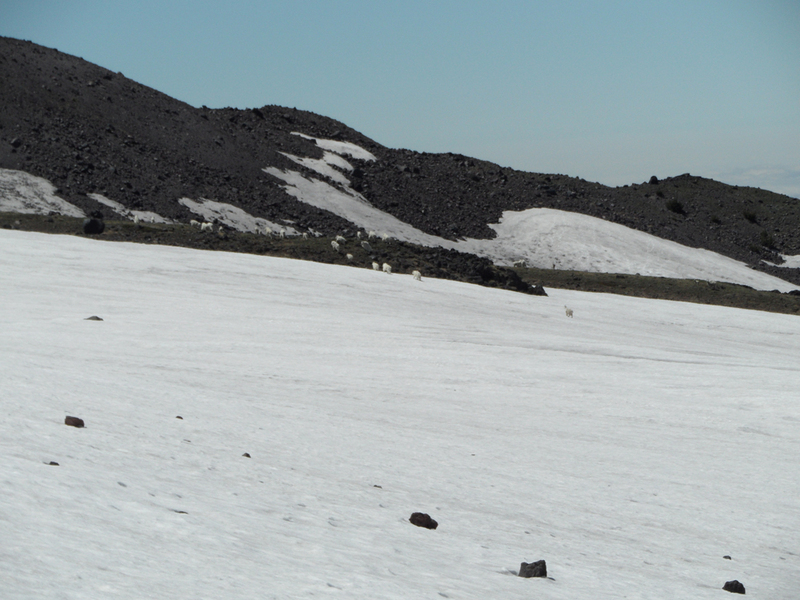 We thought we had spotted a boot track to follow, but that turned out to be goats. And they were off route! After detouring around the base of the ridge to avoid the huge bergschrund, we were on the face. 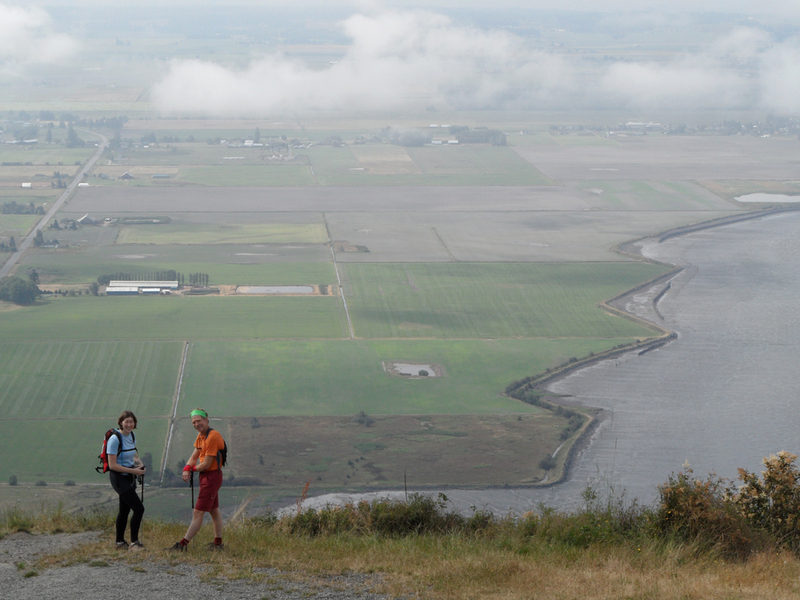 It's essentially a long, steep ramp leading to the Pinnacle, a false summit. The snow was perfect for cramponing- hard styrofoam. It was so hard that you could not easily break through it with the point of the axe. so we didn't; we just walked. The angle ran anywhere between 35 and 50 degrees, but was mostly around 45. Not terribly steep, but as we neared the top it turned into a continuous 2500' drop. 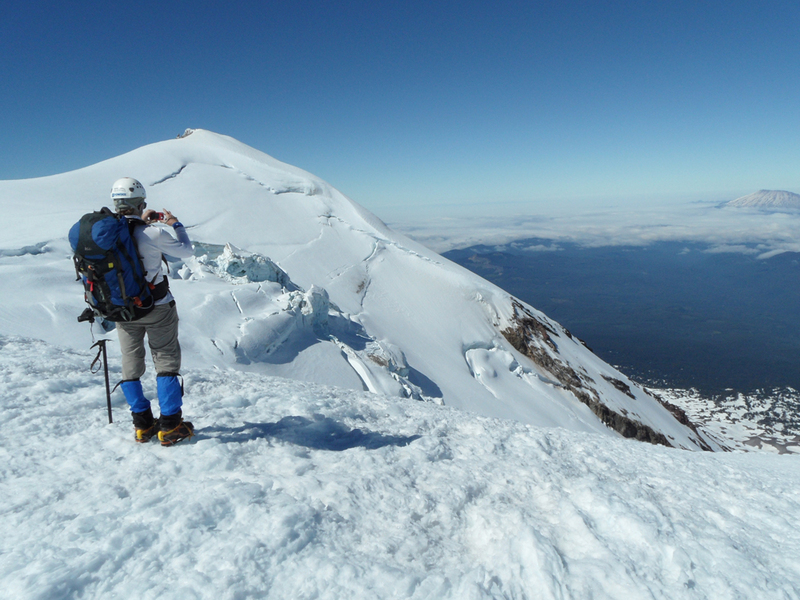 Note: SummitPost says the max is around 50°, but the guidebook says the average is over 50°. We thought SP had it right. Here's looking down a section, except it's steeper than this looks and the picture doesn't show the cliff at the bottom. As you near the Pinnacle, the angle eases off a bit. But the altitude continues gaining thinner air. And there are about five rolls that falsely appear to be the summit. 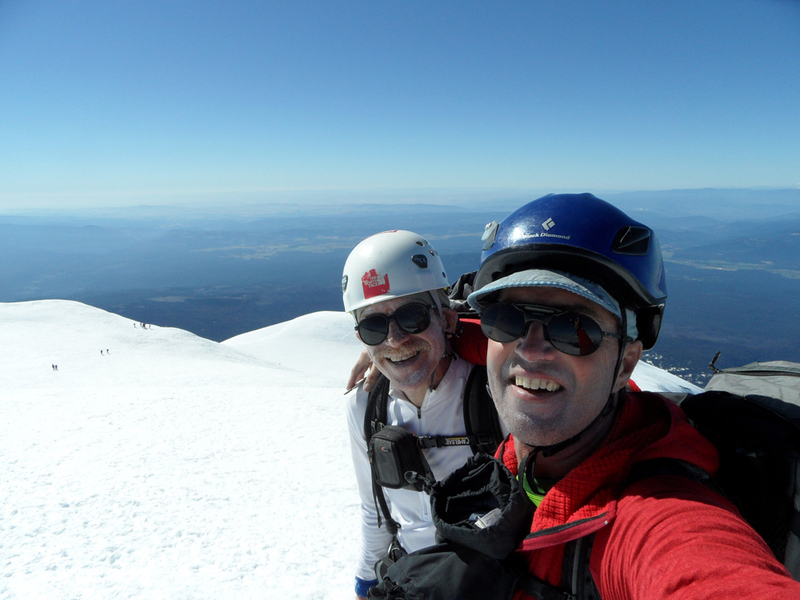 So when we finally got to the summit, we were quite happy. Too bad the weather wasn't better. The little black specs here are a few of the approximately 70 people we could see on the south side route. As Brian described it, there were people in shorts, dogs, skiers, a juggling act, mimes, etc. 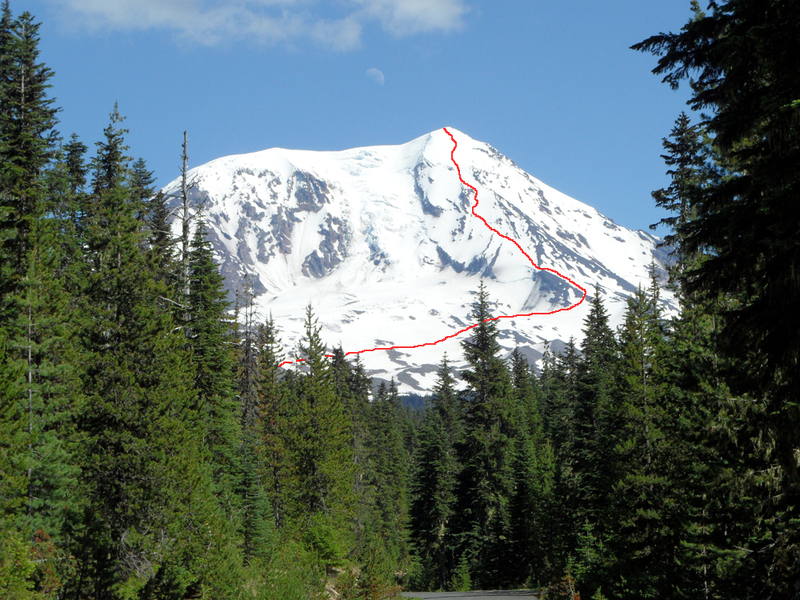 We considered what our route might be like with sun on it and our crampons balling. That, and I'm a sucker for new terrain. So even though all we'd heard about the north ridge was less than flattering, that's the way we went down. From the north ridge, here's a side view of the Pinnacle, and an oblique view of our route, which roughly followed the right hand skyline before shortcutting under the Pinnacle to the saddle on the left. The true summit is a little higher and out of frame to the left. So how bad is the north ridge? Well, here's a sampler. 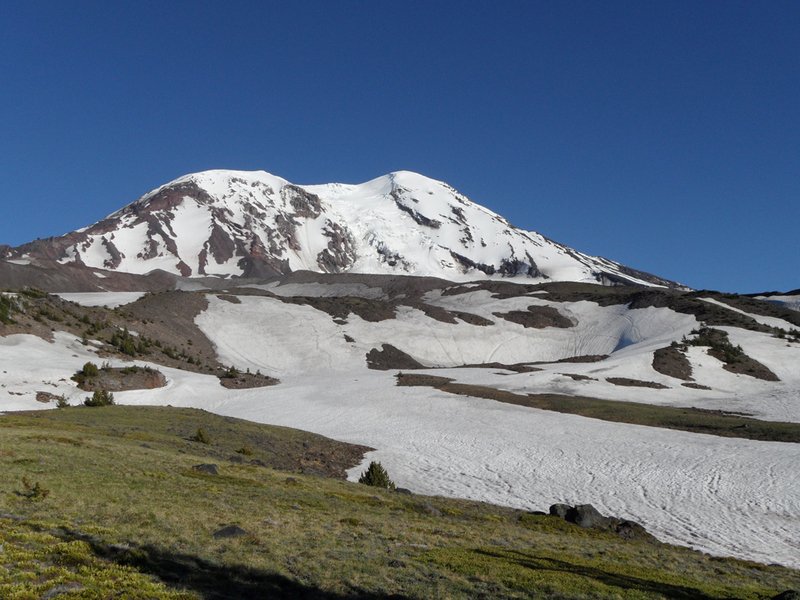 Also note the little white spec in the center, just below the snow patch. 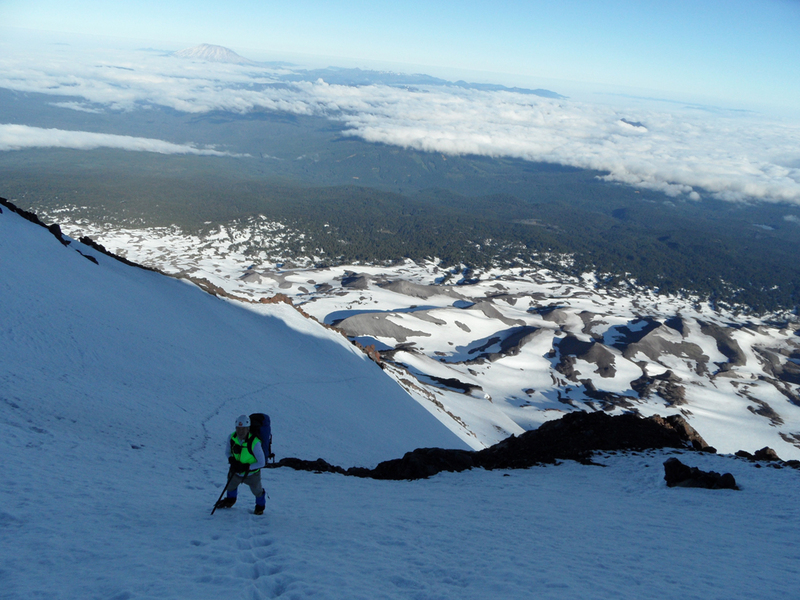 It took us quite a while to safely negotiate the super-steep and rolly scree. This stuff is different from our Idaho talus. Instead of angular blocks that exhibit some degree of inter-talus adhesion (I just made that term up), these are more like balls of various sizes, from small ball bearings and marbles to softballs and even beach balls, all prone to rolling under foot. Fun! And here we have a large grouping of little white specs. This was just above high camp. I won't bore you with more story except to explain that when I was getting blisters on the 45 degree slopes, I decided not to stop and take off my boots. Now my feet were killing me and I had a long week ahead of me. When we got back to the car, we did a long drive up to spend the night on an outside deck beside Lake Chelan, where we visited John's long-lost relatives and ate an incredible amount of incredible food. 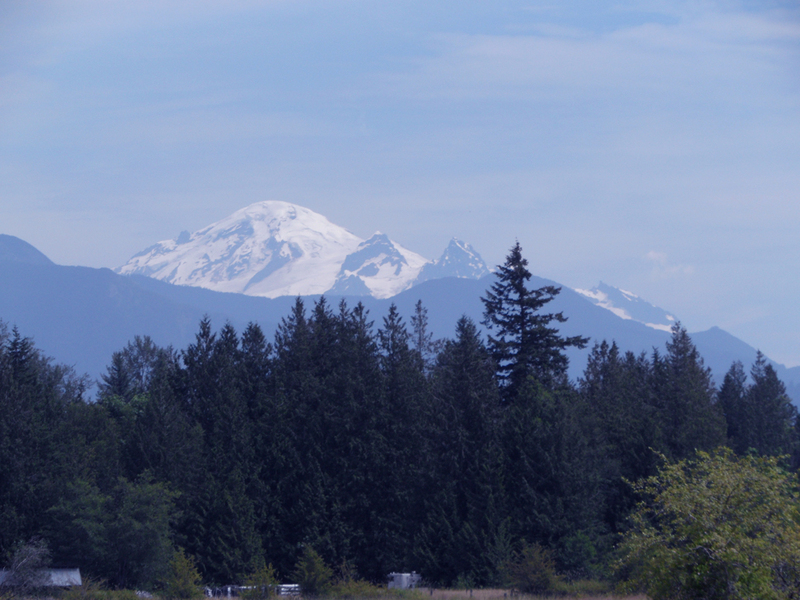 Then the next day we drove over the North Cascade Highway to Bellingham. Brian's daughter Laura is going to school at the university in Bellingham. So we crashed on the dorm room floor, then took her hiking the next day. This is the trailhead. 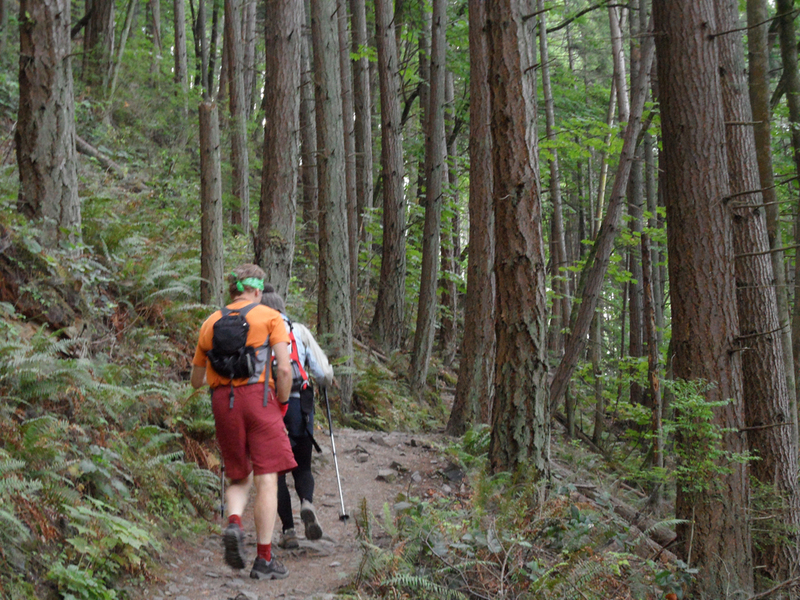 It was a really nice trail heading for Oyster Dome. However, the trail markings were a little vague, we didn't have a map, and there wasn't one at the trailhead. No worries- just enjoy the day and visit. We climbed for an hour and a half to get this awesome view of Puget Sound. We could see the oyster farms in the water, and also the Olympic range across the bay. Then we ran Laura back to her room and headed for Mount Baker. 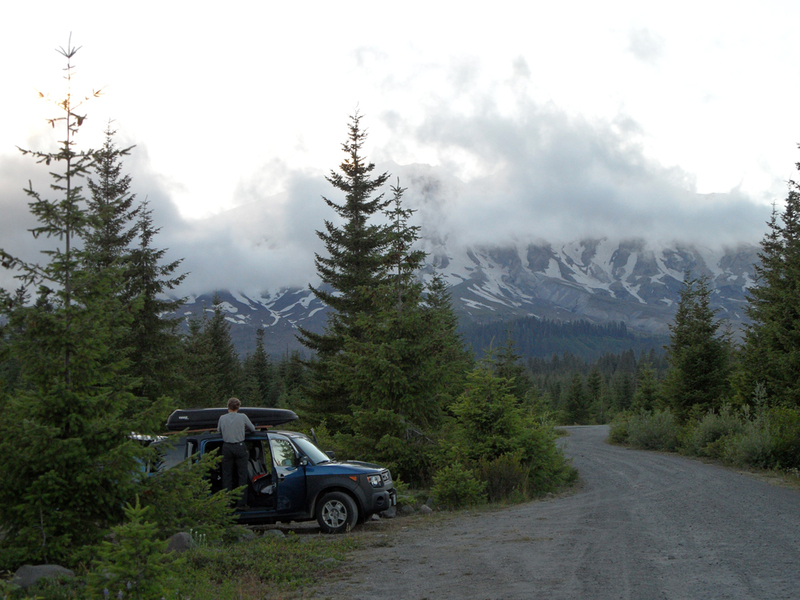 It's a pretty short drive from Bellingham to the trailhead, because you park at about 3500'. This was taken along the highway during the approach. But for you Idahoans accustomed to high trailheads, that means to climb a peak less than 11000', you have to gain over 7000'. From the trailhead, you climb about 2500' to the Hogsback, a ridge that is apparently an old moraine. 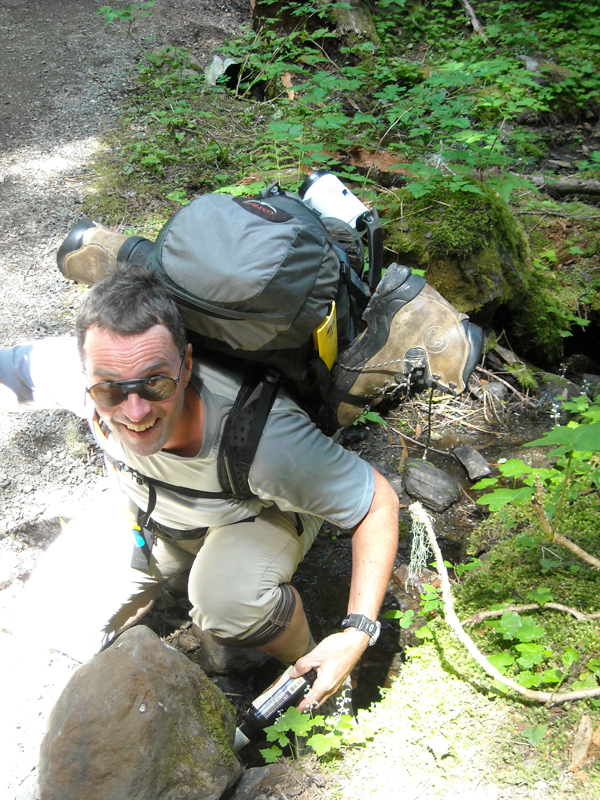 As such, climbing the loose and eroded trail up the Hogsback with a full pack is probably the hardest part of the entire climb. We got up to the campsites at about 6pm. There was only one other group there, four climbers who were resting on their way down from a tiring climb. That's the summit on the right. 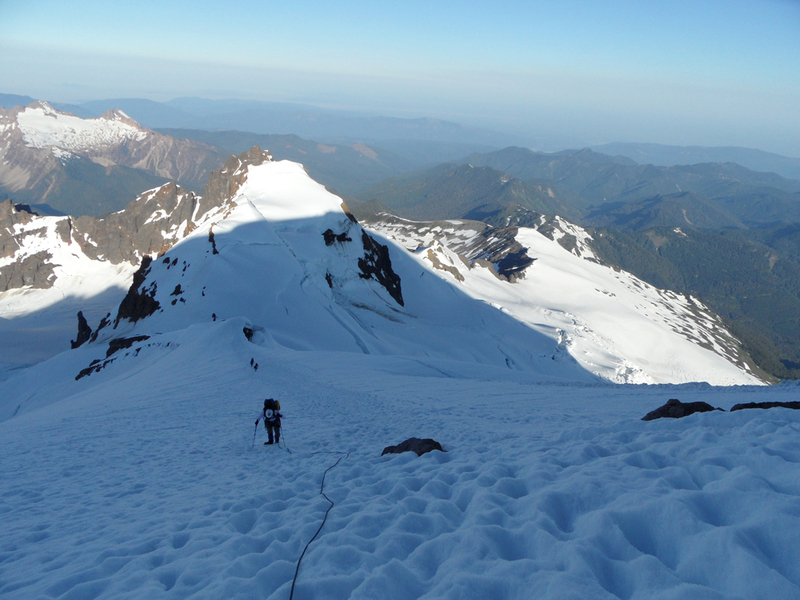 Our original plan was to climb the North Ridge, a technical route requiring two tools, screws, belaying, etc. But when we woke up at 3:30 it was 47 degrees, so that was out. 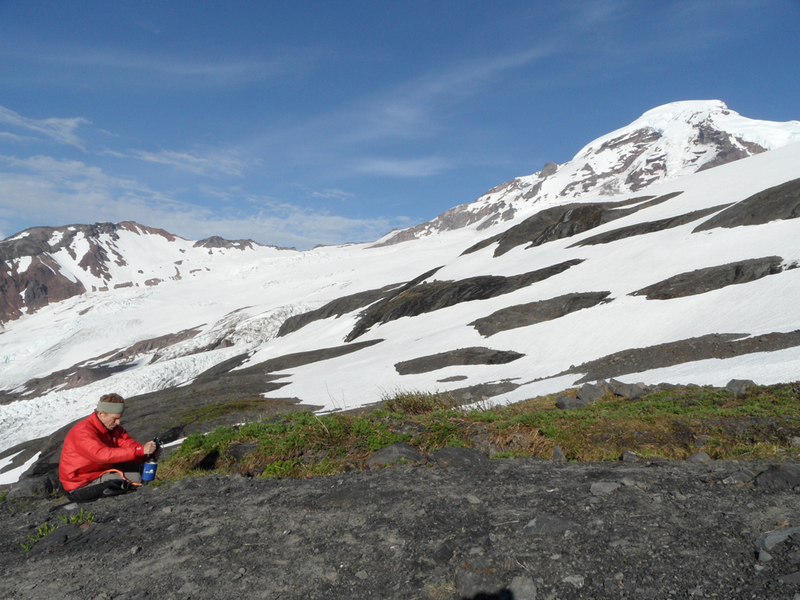 So instead we did the standard route, the Coleman-Deming glaciers route. This is an easy, fun route. We used only hiking poles all the way to the summit. 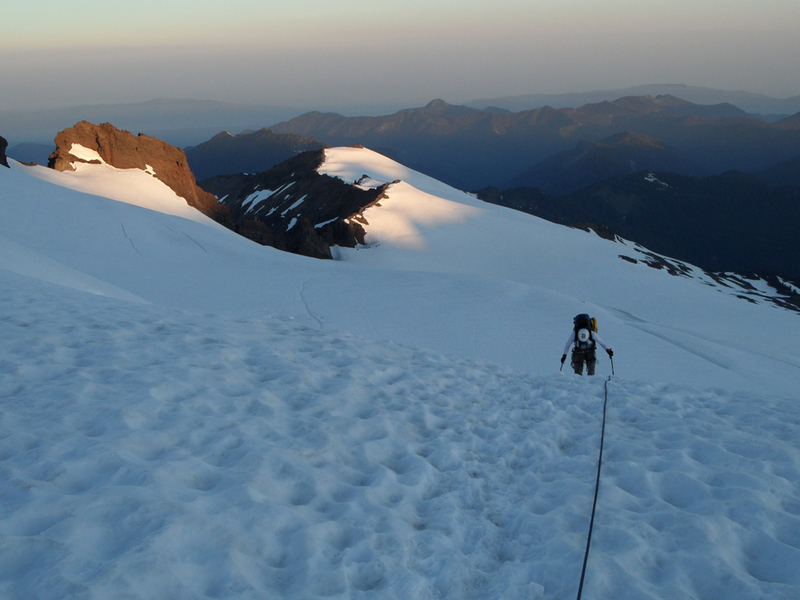 But it does have a lot of crevasses, so we roped up. Once again, a beautiful day. For those who don't think there are a lot of mountains up here, think again. This is looking north. 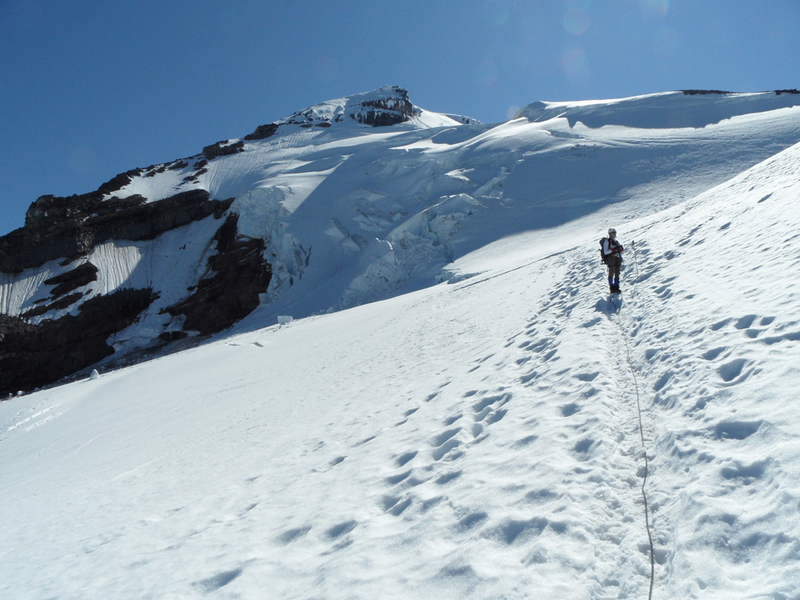 The first part of the route goes up and around the Coleman glacier. This circuitous path keeps the crevasses to a minimum. 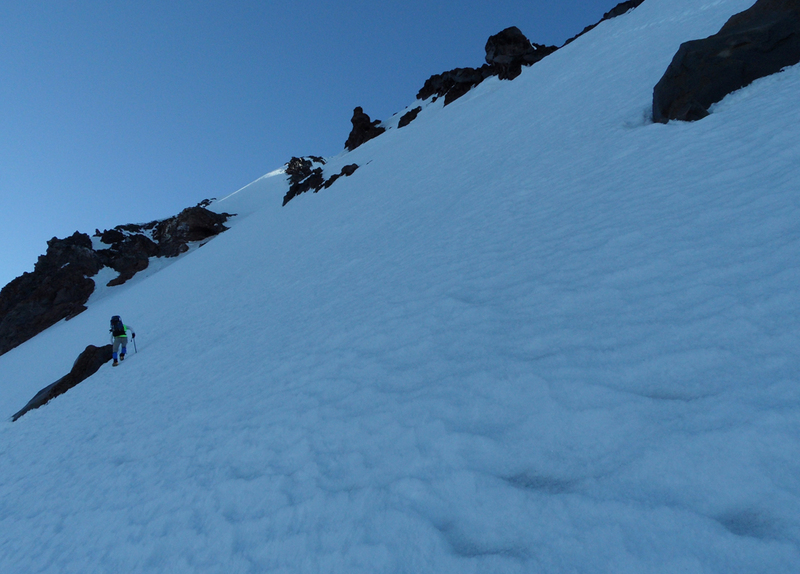 Above our camp, we did see five more climbers in a guided group-. Their camp is visible in the bigger version of this picture- look near the bottom of the sunny spot on the right. 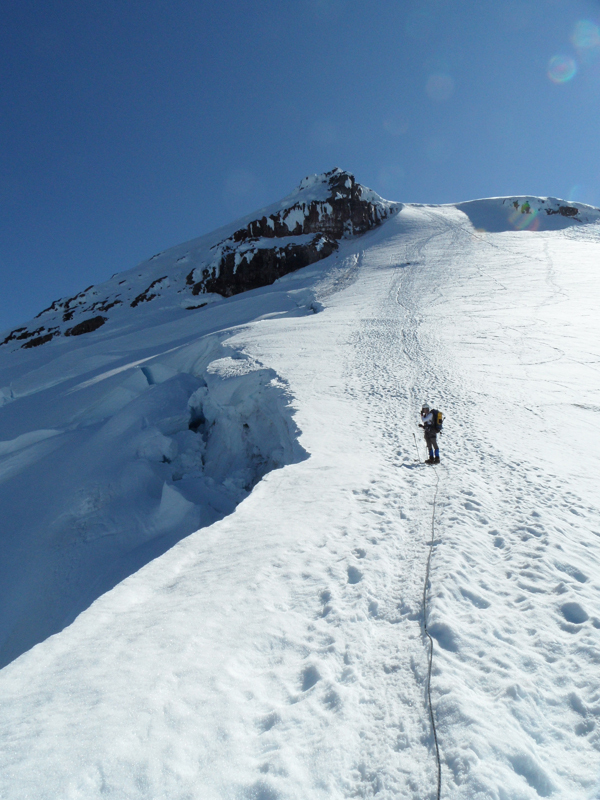 When you gain the saddle between the Coleman and Deming glaciers, you head up the ridge toward the top. This takes you to the south of the Roman Nose, a cliffy area. This area beside the nose we called the headwall and it's the steepest part of the route. 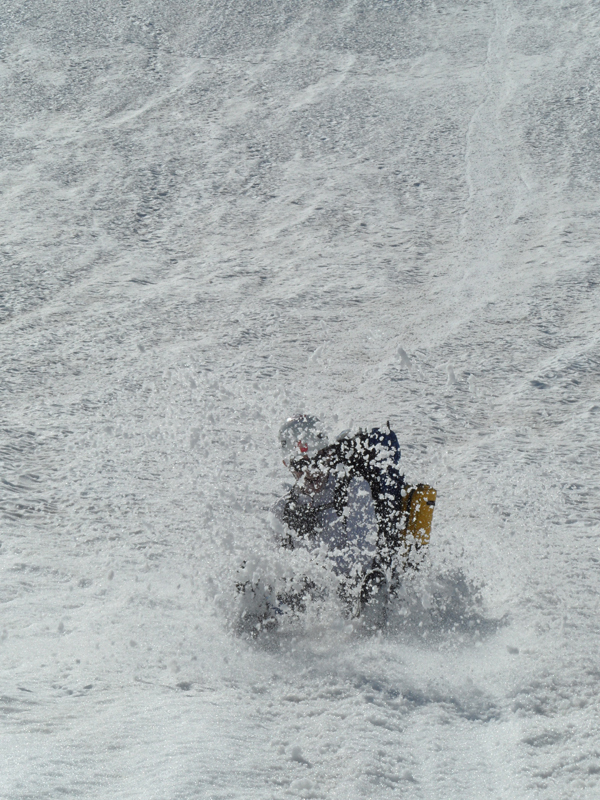 Here Brian has passed the guided group and we are beginning the headwall. We summitted at 8:05. Too bad the weather wasn't better. We're holding little giraffes, which commemorate Big Jeff. Our original plan had us climbing Mt. Shuksan, but our rest day (or rest morning) at Lake Chelan had put us slightly behind. 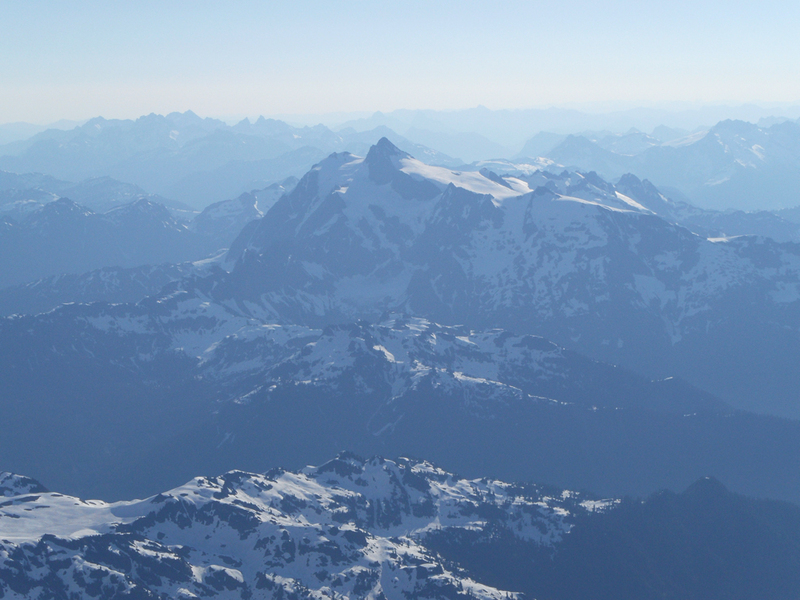 Oh well- we enjoyed the more relaxed pace, but will definitely be back to try Shuksan. This is a very cool peak. Photo taken from atop Baker, so they are very close. This is looking back up the ridge leading to the headwall. And here's me peeking over that drop... but not too close. A little further down the ridge. There is also a headwall of sorts right above camp. It's about 800' and fairly steep. By the time we got there, it had softened up to what you can see are absolutely perfect glissading conditions. Wahoo! Being as we are both very experienced mountaineers, we know the importance of keeping your beer stash cold. This culvert was about 50' short of the car- very convenient. When we checked out at the ranger station after the climb we discovered that the group camped near us, who we passed on the trail back to the car, had returned late and triggered a Search and Rescue team. Ooops. 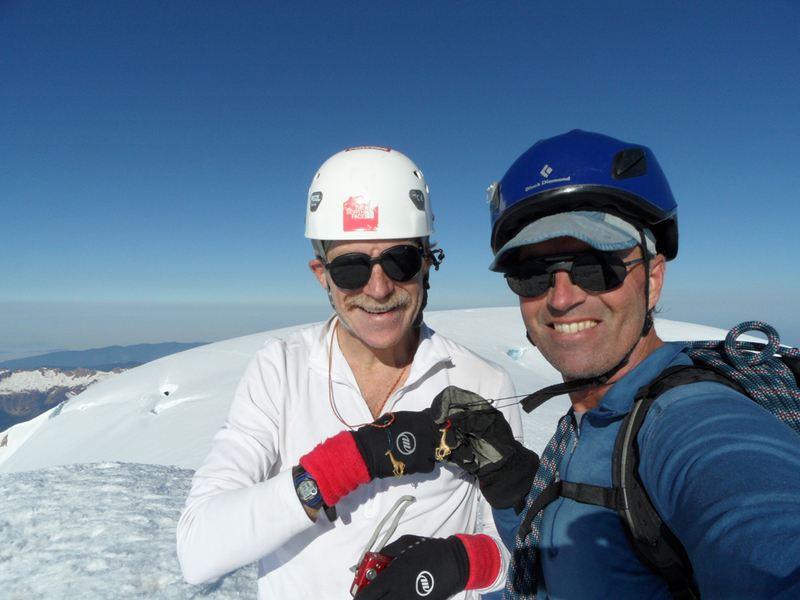 Read the summit log of DustyDeb9. After Baker, we drove to Brian's house and I slept in a bed for the first time in a few days. That was pretty cool. 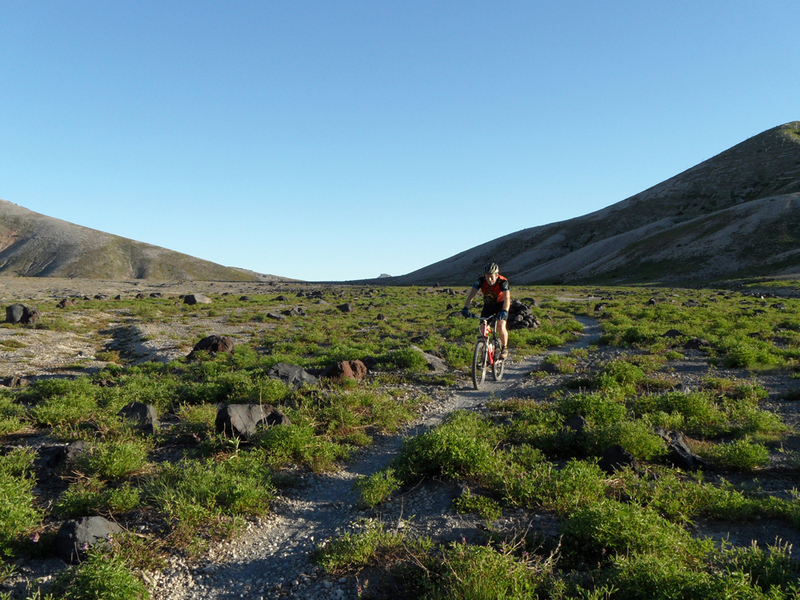 Then we headed south to do the 60 @ 60, a sixty-mile day of mountain bike riding to commemorate Jeep's 60th birthday. Here's our campsite on the shoulder of Mt. St. Helens. 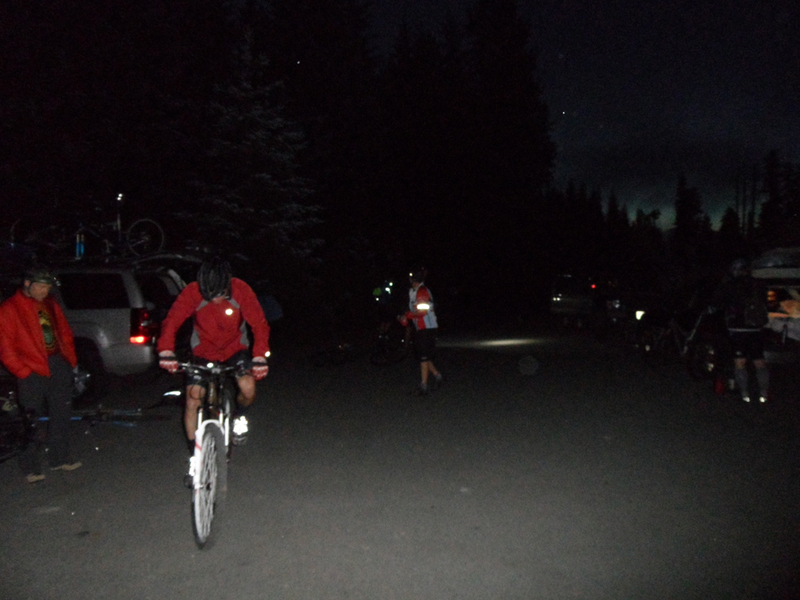 And here we are getting ready to ride the Ape Canyon trail at 4:45 am. More coffee, please. Brian and I both had heavy legs this morning. It was a tough way to start the day. After a couple of hours, we felt a lot better. But that suffering had a lasting effect on me. Brian on the Plains of Abraham. I find picture-taking difficult on a bike, and it interrupts the flow (and makes it hard for me to keep up). So not a lot of photos. Me on the Plains. Pretty flowers. I had previously ridden three of the four trails we did on this day (although never all together). 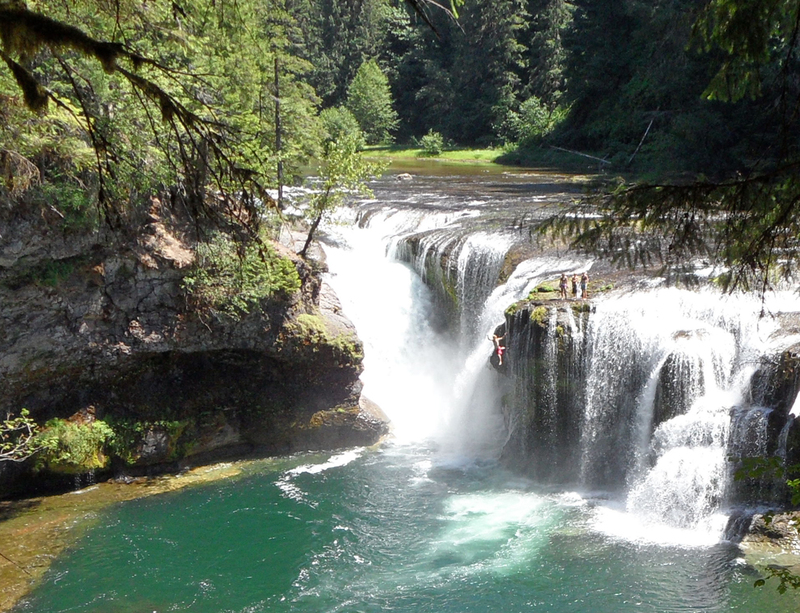 The new one was the famous Lewis River Roller Coaster. This trail was really fun, but there is so much up-and-down (and off-and-on the bike) that I was feeling pretty whipped when we got to the the falls. Look closely at this picture. No, that is not me. I skipped the last ride, the Falls Creek trail. But Jeep didn't. 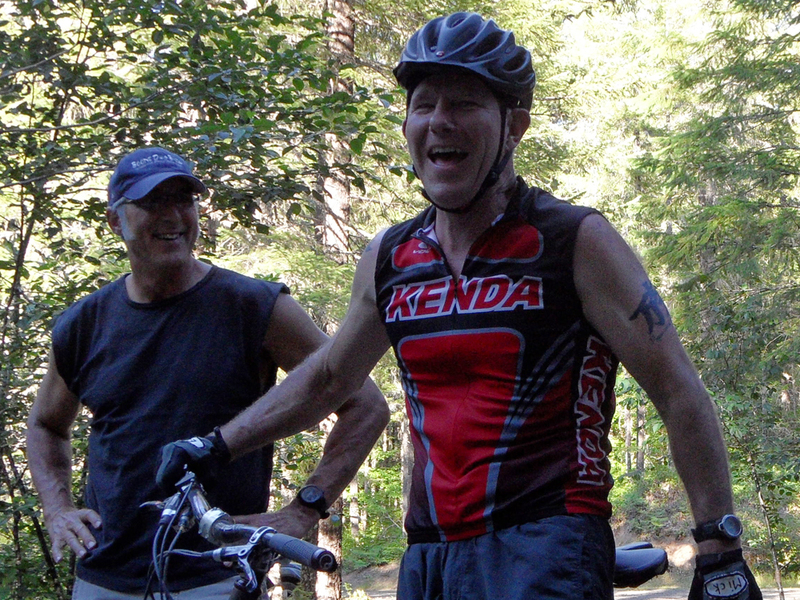 And although most folks mourn turning 60, at the end of the Falls Creek ride, he seemed pretty happy. Oh- perhaps that was because he was done? Jeep's blog has the details. This video tells the story pretty well.